i always see them on craigslist, old boats that is, i like the ones with fins! Uh, oh. 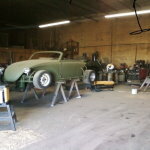 Now the VolksRod might not get finished if you're out cruising the sand bars.